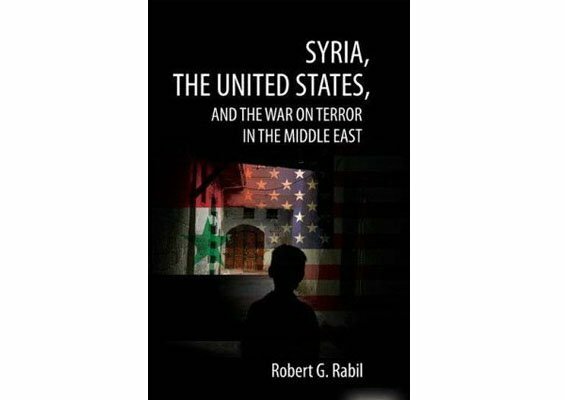 "Syria, the United States, and the War on Terror in the Middle East"
Robert G Rabil's book Syria, the United States, and the War on Terror in the Middle East is much more than an overview of United States-Syrian relations. It sketches the most important developments in the Levant and its surroundings from the mid-20th century to today. Thus it also deals with Israel, Lebanon, Turkey, Iraq, and Iran, while keeping a clear and systematic focus on how their complex interconnections link to Syria's foreign policy. The book covers a wide canvas as it sketches the background of Syrian collective consciousness, i.e. Syria's nationalist struggle for independence and the emergence of modern Syria under the Ba'athist regime and Hafez al-Assad; addresses US-Syrian relations during the cold war and a series of Israeli-Palestinian confrontations; tackles bilateral relations during the peace process (1991-2000) and after 9/11; and analyses the factors contributing to the more recent collision-course between the US and Syria, including Lebanon. One of Rabil's original observations is that Syria's current foreign-policy rhetoric is based to a growing extent on the claim of a clash of civilisations. An eloquent champion of this view is Syria's minister of expatriates, Buthaina Shaaban. She argues that western anti-semitism is taking on a new form as anti-Arabism, manifesting itself in unsanctioned Israeli killings of Palestinian civilians or the torture of US soldiers against Iraqi prisoners. Shaaban is convinced that this treatment stems from a racist, condescending view of Arabs. The logic is that protecting Arabism becomes synonymous with protecting its sole "left" champion: Syria and its regime. Even the Syrian opposition is stuck between its demands for more sweeping reforms and a nationalist stance. The long-term Syrian leader Hafez al-Assad, unlike his putative Ba'athist ally Saddam Hussein, had subordinated pan-Arab nationalism - and thus the Palestinian question - to Syrian raison d'état. In his foreign policy he violated Ba'athist principles on various occasions. But after the destruction of Iraqi Ba'athism, Syria now finds itself in the position of being the sole pan-Arab mouthpiece. Hafez's son Bashar al-Assad has exploited this unexpected role as a resource of support and sympathy far beyond public opinion in Syria. By choosing this ideological path he gambled high and burned whatever bridges to Washington existed, without - as recent high-profile visits to Damascus, such as that of Democratic speaker of the House of Representatives, Nancy Pelosi, indicate - paying a career-threatening price. In the past, as Rabil describes, US-Syrian relations have witnessed many ups and downs. After 1945, the US had an equally good relationship with Syria as with Israel. Rivalry began with the cold war and the Arab nationalist equation of Israel as a colonial entity. The turning-point was 1967, when the US crystallised as Israel's most faithful ally and the Soviet Union became Syria and Egypt's main arms-supplier. In the mid-1970s, after US secretary of state Henry Kissinger had mediated the plan to disengage from the Golan Heights (won by Israel in the 1967 war), the atmosphere between the US and Syria again became friendlier. In 1975, Syria's foreign minister (later a dissident) Abdul Halim Khaddam was even received at the White House, and the US granted loans and aid to Syria. The Gerald Ford and Jimmy Carter administrations were the champions of this approach, which gave the US leverage to influence both sides of the conflict. The next decisive turn was 1979, when Syria appeared on the US state department's "terrorism list", which entailed economic sanctions. Still, the US believed that Syria played a pivotal role in the region, and the resulting ambivalence saw a combination of sympathy towards Syria from the US executive branch and hostility from the legislative branch. Carsten Wieland is a political consultant and journalist, specialising in the middle east, where he lived for several years. He studied history, political science, international relations and philosophy at Humboldt University in Berlin, Jawaharlal Nehru University in New Delhi and Duke University in North Carolina, before working as a research fellow at Georgetown University, Washington, DC. He is the author of Syria  Ballots or Bullets? Democracy, Islamism and Secularism in the Levant (CUNE Press, 2006) and Syria at Bay: Secularism, Islamism and Pax Americana (C Hurst, 2006). Terrorism brought the two countries apart and together at the same time. Syria helped the US to broker several deals to free US hostages from Lebanese Shi'a and Palestinian terrorists in the 1980s and early 1990s; US terrorism reports of the mid-1990s found Syria innocent of terrorism and a moderating force on Palestinian organisations and Hizbollah, although they stated that Syria was permitting Iran to deliver arms to the Lebanese group. In 2002, the US state department conceded that Syria had not been directly involved in international terrorist attacks since 1986. But Congress remained unimpressed as long as Syria harboured Palestinian organisations on its soil. The relationship remained contradictory. This continued after the 9/11 attacks, when Syrian intelligence shared valuable information about al-Qaida members and helped to save American lives. Rabil notes an interesting shift in the US's operational attitude to terrorism. In 1990, secretary of state James A Baker came to share Syria's definition (that any acts of violence outside the Israeli occupied territories were considered terrorism, whereas acts of violence within these territories were considered resistance to Israeli occupation); but George W Bush's administration - especially after 9/11 - adopted Israel's definition, which refuses any such differentiation. This prevented Syria - an experienced and (as in Hama in 1982) ruthless opponent of Islamist activity - from profiting from 9/11 as a pro-American anti-terrorist protagonist; the contrast with Pervez Musharraf's Pakistan, despite that country's ambivalent record, is striking. After the death of Hafez al-Assad in 2000, the 9/11 attacks, and Syria's staunch opposition to the Iraq war, the dynamics of US-Syrian relations changed yet again. For the US, Syria became an extension of the "axis of evil" first announced in January 2002. Rabil writes: "Ironically, where the senior al-Asad had sacrificed Arab nationalism at the altar of Syria's national interest in general and regime security in particular, the Syrian leadership today has been advancing Arab nationalism with the objective of countering US plans in the region." Rabil far-sightedly points out that Syria's weak point will turn out to be Lebanon. He describes the fatal mistakes of the Syrian regime in late 2004, which culminated in the assassination of former Lebanese prime minister Rafiq Hariri in February 2005 and the reluctant withdrawal of Syrian troops after almost thirty years of occupation. Thus Syria fulfilled part of the United Nations Security Council Resolution 1559, which its sponsors (France and the US) saw as a tool to curb Syrian power. Only a minority in the US intelligence establishment warned against a vacuum in Lebanon that would unleash Islamist terrorist forces and leave Hizbollah unrestrained. Against the background of the Israel-Hizbollah war of July 2006, Rabil's book is ideally placed to aid understanding of the latest dynamics. Only the author's optimism with regard to Lebanon's domestic political development seems a bit overstretched in light of the most recent events. Lebanon as the envisaged (by the US) model democracy in the region may have to go through the tough - even suicidal - process of disarming Hizbollah under aggravating circumstances in order to emerge. Moreover, one result of the conflict (as Pelosi's and other visits indicate) is to return Syria to the diplomatic limelight. This adds emphasis to Rabil's well-taken conclusion that the future of the Israeli-Palestinian peace process may depend a lot on how Washington and Damascus deal with each other. Rabil speaks of a "dying regime" in Damascus, yet also holds that "Washington needs to articulate a Syrian strategy" and warns against a "miscalculated or hubris-laden" campaign against Syria which could lead to anarchy in the country and promote fertile new ground for terrorism. The conclusion, like the foregoing analysis, is a dispassionate and scrupulously researched account of middle-eastern political dynamics. Those who have made or might consider a trip to Syria and the region could benefit from reading it.